I think most of the time in the East, like in Tibet or Himalayan region, when you ask somebody: “Why do you practise Dharma?” They would most probably say: “I am preparing for my death” or “I’m preparing for my next life.” Because for most of the people there they kind of feel that this life is no problem. There will be ups and downs, there will be some problems, there will be some obstacles that anybody who is in samsara or in a samsaric state of mind will have to face. But that’s nothing really. It’s okay. So what I have to really work on is for the long term perspective, for my death, for my next life and my next life and my next life . 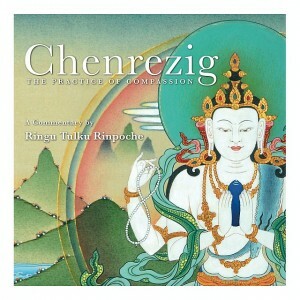 So therefore, the kind of way of looking at practising Dharma is usually not for this life but for the lives to come. And when I look at the kind of motivation or aspiration of most of the people in the West when they want to practice Dharma, they want to practice it for this life. So that they can have more peace of mind, more joy, more tension free. That they can do something so their life is becoming better now. It doesn’t mean that you don’t care for the future but primarily it’s for now. Sometimes some lama’s think that’s a wrong motivation. It’s even said, in some of the teachings. that if you really practice Dharma and you do it only for this life, it’s wrong. But I think it’s really not contradictory, it really comes together. It’s very important that we work on how to live, how to face life now, and in these circumstances in a proper way. And if we can do that, if we can find a little more peace, a more genuine way of dealing with the problems and stresses and emotions of this life, that’s exactly in a way working for the benefit of our next lives as well as for the death. So therefore whatever you say, whatever you’re kind of perspective may be, it comes to the same thing. So therefore sometimes the life and death are very related, very connected. Everybody has to die. And whether we want to accept that or look at that or focus on that or whether we want to acknowledge that or not, that’s a fact. And I think it’s also not useful if you kind of deny this fact that we all have to die. Because we know, everybody knows that everybody has to die. And that just by not talking about it or just by sweeping it under the carpet, the fear of death and death doesn’t go away anyway. This kind of way of denial, when it comes to the experience of dying and death people can be totally unprepared and can be totally shocked. I think it becomes very important to acknowledge and accept this fact that everybody has to die. And not only that we have to die and we don’t know when we will die. There’s no certainty, the uncertainty of life can become a little bit shocking or a little bit depressing if you are not prepared. There is no guarantee that I would not die tomorrow or the day after tomorrow. To really be able to accept this and see this clearly and fully acknowledge this, sometimes is the best preparation for the whole thing.